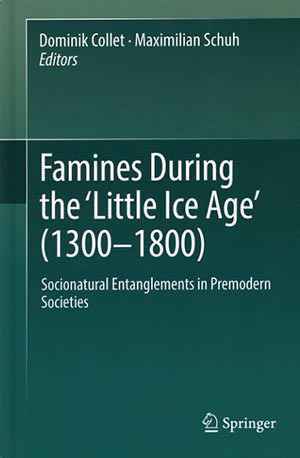 “Famines During the ‘Little Ice Age’ (1300-1800)” is a narrow title for this expansive and thoughtful book. The essays cover a timespan ranging beyond the title’s five hundred years (including the eighth century up to 1816). The essays also provide useful new ideas about how historians can think about social responses to both famine and environmental change writ large. The editors hope to move beyond earlier debates focused narrowly on famine causality. At one point, this debate was between Marxist and Malthusian camps in the “Brenner Debate”. More recently scholars have wrangled between “natural” causes still underpinned by questions of population and newer approaches based on Amartya Sen’s entitlement approach, describing famines as human caused events arising from economic and social disparity (p. 7). In place of this debate, the authors describe famines as complex events involving a “tangle” of causes both social and natural. Famines “can challenge social and climatic determinism and suggest alternative, more dynamic approaches to the entanglement of environment and society” (p. 5). Additionally, the editors point out how famines can help break down disciplinary boundaries by requiring both natural (archives of nature) and social (archives of man) data to be fully understood (p. 6). They stress that effective future studies of famines as both complex and multi-causal will require expertise in multiple areas to be completely understood as natural and as historical events. While not every article adopts the “entanglement” language of the introduction, all of the entries move beyond the older causality debate and acknowledge that famines are complex disasters. Several articles use this perspective to reread previously known famine sources. Chantal Camenisch’s article on central European shortages and Rudolf Brázdil, Oldrich Kotyza, and Martin Bauch’s article on Czech famines before 1500 both use several famines to show how both Food Availability Deficit (FAD) and Food Entitlement Deficit (FED) models come into play in the same event. Market failures, social disruption, and economic inequality (FED influences) appear side by side with real harvest failures and climatic disruptions (FAD influences), the compounding of multiple factors leading to more severe crises. Similarly, Guido Alfani describes how FAD influences were and were not mitigated by the strong economies and markets in Italy during the 1590’s. Stephan Ebert discusses how Carolingian writers might have tried to shape their historical narratives of famine to mitigate the view that leaders like Charlemagne failed in their royal responsibility to mitigate shortages. Several articles offer broader directions for research into human-natural connections. Andreas Rüther’s article on migration patterns towards eastern Europe assesses where famines and climate crises fit into theories of migration as “pushes” towards human movement. Andrea de Vincenti’s work on a Swiss famine at the end of the eighteenth century notes how moral education could serve as a strong symbolic response to shortage by the elites (especially enforced fasts). Calls for moralized educational responses simultaneously reinforced the power structure of the time against the threat of unrest brought by famine. Jessica Dijkman’s article more optimistically notes how Dutch poor relief systems could provide real social cohesion and prevent the worst ravages of famine when effectively managed. Marin Schulz, investigating how famines end rather than begin, offers an excellent reading of both written and visual sources of how the German Parade of the First Harvest Carriage represented an opportunity for the entire community to reaffirm its own hierarchy before both the current elites and the king as well as before God. The parade’s religious overtones allowed a reconnection particularly to God, seen as the ultimate cause of suffering and famine, attempting to signify a more complete healing of the society itself and pacifying any remaining social disruption or anger. These responses represent part of the social structures of famine, whether they are efforts to keep elites in power and reduce rioting or genuine works to reinforce the social bonds that provide society with real resilience in the face of unpredictable natural fluctuations. Each is a welcome new way to think about resiliency and response to large scale famines. Most notably, Steven Serels’ chapter on the Red Sea region presents a tantalizing question about the relationship between famines, climate, and human society. Drawing on Geoffrey Parkers ideas about a seventeenth-century crisis, Serels notes that evidence for the Ethiopian coastline or related areas is weak. The article contends that the same upheavals related to the change in climate did indeed take place, but that they are displaced in time by a century. If such temporal displacement is common, we have no reason to expect a particular disaster to result in social change in a short time span. Incremental social changes (a sort of evolutionary approach to human-climatic interaction) can potentially stave off disaster for decades. The article offers an example of how societies can tinker around the margins to sustain the status quo. The collection is less successful at the second goal of creating multidisciplinary research projects, built from their inception to utilize both human and natural sources. While many of the above articles offer new directions and strong contributions, they are, on the whole, fundamentally historians reading traditional historical sources with an awareness of relevant research into the natural world. The first two articles in the book, Bruce Campbell’s article on how shortages interplayed with the arrival of the Black Death and Heli Huhtamaa’s article on combining tree ring data with early administrative evidence to study famines in Finland, provide the clearest attempt to create multidisciplinary studies along these lines. Campbell’s article builds on the themes laid out in his book, “The Great Transition”. Campbell provides a deep knowledge of the changing climate and its confluence with disease. However, the thoroughness of the natural evidence does not lead Campbell to particularly new conclusions about late medieval famines and their social implications. Huhtamaa’s article, while narrower in its goals than Campbell’s, provides a solid example of how to incorporate both natural and documentary sources with a strong awareness of the strengths and weaknesses of both data sets. The article provides useful methods for how to calibrate these disparate data sets against each other to provide the best conclusions about incidence of shortage caused by climatic changes. As the final article by Andrea Fadani on museum portrayals of past famines reminds us, the modern portrayal influences how we attempt to resolve and distribute food today. This collection does an excellent job of including all the many facets of famine within its purview: environmental influences, economic structures, social resilience or vulnerability, systems of relief, and the reestablishment of the social hierarchy in the wake of the crisis. One unfortunate drawback is that there has not been more communication between groups doing similar work. Collections by groups working on famines in the medieval Mediterranean sometimes cover similar terrain; perhaps because of their medieval focus or their different geography, that work is virtually absent from the bibliographies of these articles. This does not detract from the overall quality of the volume, however. Perhaps the most notable contribution is the clear persistent message that medieval and early modern societies themselves saw famines as complex events with multiple possible responses. New agricultural methods, migration, better trade relations, poor relief, prayers, and moral education all represent real pre-modern options when responding to food crises. The debate around causes began hundreds of years ago and reminds even modern researchers to be comfortable with multiple viewpoints. This work joins a growing body of famine research that should allow historians to treat not only of our often quite old subjects, but carry on a relevant conversation in understanding how we continue to think about, describe, and respond to food crises today and in the future. Trevor Aston / C.H.E. Philpin (eds. ), The Brenner Debate: Agrarian Class Structure and Economic Development in Pre-Industrial Europe, Cambridge 1985. Bruce Campbell, The Great Transition: Climate, Disease and Society in the Late-Medieval World, Cambridge 2016. Pere Benito i Monclús / Hipólito Rafael Oliva Herrer (eds. ), Crisis de subsistencia y crisis agrarias en la Edad Media, Sevilla 2007; Pere Benito i Monclús (ed. ), Crisis alimentarias en la Edad Media: modelos, explicaciones y representaciones, Lleida 2013. Adam Franklin-Lyons: Rezension zu: Collet, Dominik; Schuh, Maximilian (Hrsg. ): Famines During the "Little Ice Age" 1300–1800. Socionatural Entanglements in Premodern Societies. Berlin 2018 , in: H-Soz-Kult, 28.03.2018, <www.hsozkult.de/publicationreview/id/rezbuecher-28184>.